The venue is Biocafé Tellus, Vattenledningsvägen 46, 126 33 Midsommarkransen. From T-Centralen, take the RED line metro (Number 14) south towards Fruängen to Midsommarkransen station. When exiting the barriers in the metro station, the quickest way is to turn LEFT & walk up the ramp. At the top, you will turn LEFT onto Tegelbruksvägen, take the 1st RIGHT & then LEFT at Tellus Pizza. The cinema will be on the right hand side of the street. It is less than 5 minutes walk from the station. The alternative route is to exit the barriers in the metro & turn RIGHT. Go up the steps onto the street & turn RIGHT again. 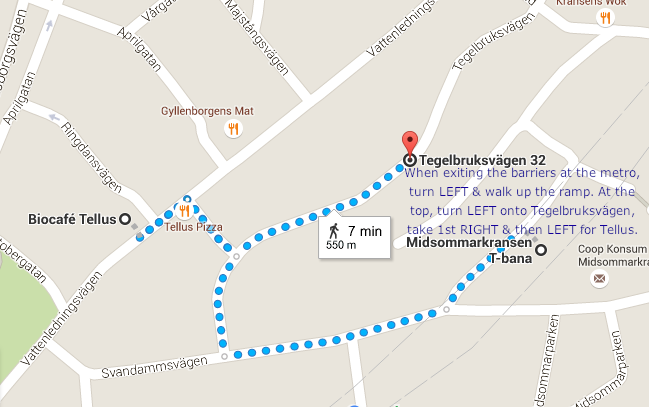 Continue along Svandammsvägen, take the 1st RIGHT onto Tegelbruksvägen, then LEFT & LEFT again at Tellus Pizza. The cinema will be on the right-hand side.